Nigerian man, Emery Henry Ogba has been arrested by Thai Tourist Police after he allegedly duped a Thai woman in Lampang province of Bt100,000 nearly N2million. Tourist Police Bureau deputy commissioner said in a press conference yesterday that the suspect, Emery Henry Ogba, was a member of a gang believed to have a monthly income of Bt1 million from illicit operations. 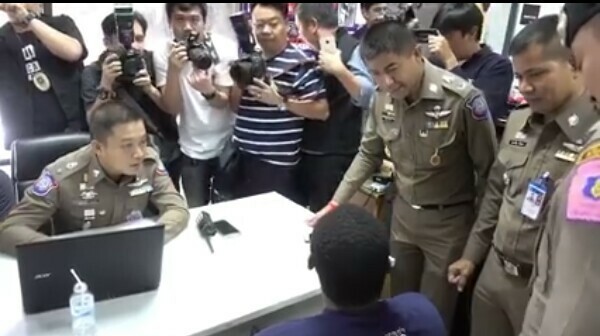 Ogba was nabbed at a department store in Nonthaburi province on April 21, following an arrest warrant issued by a Lampang Court on March 29 on charges of fraud and overstaying his visa. Police seized Bt42,700 in cash, some ATM cards and bank books, and four mobile phones. Surachet said that one of the conspirators was a Thai woman. The suspect used the Facebook photo of another man. After about two months, he said he wanted to send her a large sum of money and some other items, but he asked her to send him some money to pay tax. A Thai woman then called the woman and convinced her that she was a government official and that she should do what “Westwood” requested. The victim wired him money twice, totalling about Bt97,000. The next time the so-called government office rang her trying to convince her to wire more money, the sound of a baby crying was heard during the telephone conversation.